In a forum at Princeton University's McCosh Hall entitled "Higher Education and the Intellectual Culture: Is Reform Possible? ", columnist George Will and Robert George, director of the James Madison Program, presented themselves as tough- and fair-minded intellectuals in a sea of liberal academic group-think and political correctness. Universities, said George, should be encouraging thought rather than shutting it down. Conservative students, he alleged, express their views in term papers at the risk of being penalized with a lower grade by liberal professors. George praised those who speak out against the majority view, even the supermajority view, mentioning climate change on several occasions. "Someone who questions your view is your friend", he said, recounting his one-on-ones with Cornel West. In the best encounters among intellectuals of different viewpoints, "the need to win an argument dissipates. When that happens, we're in business, we're on the right track." Both spoke highly of, in John Stuart Mills' words, being "willing to entertain reasons why we might be wrong." George Will, who in personal appearances softens his hard-edged intellect with a ready, self-deprecating sense of humor, referenced a book he had written, "read by dozens, half of whom are in this room today", in which he wrote about the "spirit that you're not too sure you're right." This idealized image of intellects in the pursuit of truth, humbled by an awareness of human fallibility, is appealing, but could not contrast more with the world George Will inhabits, where terse, mocking dismissal of opposing views is the norm. Read a George Will column such as this polemic against liberals, and you will see no evidence of readiness to be wrong. Dismissing the overwhelming scientific consensus on human-caused climate change, Will portrays himself as an Einstein fending off Nazi conformists. There is precious little in Will's writing style that encourages reflection, exploration, open-mindedness, and humility. One thing George Will excels at is tossing out memorable phrases, like "the manufacture of synthetic indignation", or a "saving multiplicity of factions." The latter refers to James Madison's apparent promotion of "a varied means to buy property", which could be taken to mean we should encourage great wealth and great poverty in order to avoid the tyranny of middle class conformity. If George Will and Robert George were truly serious about considering their own fallibility, and not just that of academia, they could begin by exploring where their arguments lead. In a surprising number of cases, they lead to letting people off the hook. Conservative arguments can be boiled down to this: "Don't let liberals make you feel bad." Don't worry about the collective impact of our lifestyles on global climate. It's all a hoax. Don't worry about the plight of the poor. They deserve it. Don't worry about trying to make government work well. It's dysfunctional by definition. Don't worry about regulating markets. They'll take care of themselves. Don't worry about species other than our own. They don't matter. And are you fabulously wealthy and want to feel good about paying a lower tax rate than your secretary? Congratulations. We have recast you as a champion of economic diversity. Hovering over these two prominent conservatives, as they lectured academia on the importance of fighting against group think, was the conformity exhibited by conservative leaders in refusing to acknowledge human-caused climate change, and the propaganda techniques used by one of Will's employers, Fox News. For instance, leading up to the 2003 invasion of Iraq, Fox News cleverly switched to images of Saddam Hussein brandishing a rifle when opponents of the Iraq invasion spoke. Image overwhelmed whatever words were being spoken. Similarly, a "Green Tyranny" logo hung in the background while Fox host John Stossel pretended to have an open-minded discussion of climate science. Having invested so much of his reputation in denial of human-caused climate change, what would be the consequences for George Will's career if he were to change his view? Is a pundit who is hired to fill a certain ideological slot and dependably feed red meat to an expectant audience really free to reflect and reconsider? Will and George spoke repeatedly of the dangers of tyranny. To guard against these dangers, we must promote and sustain divergent views. This raises the question: At what point do we know enough about a potential threat to take unified action as a nation? 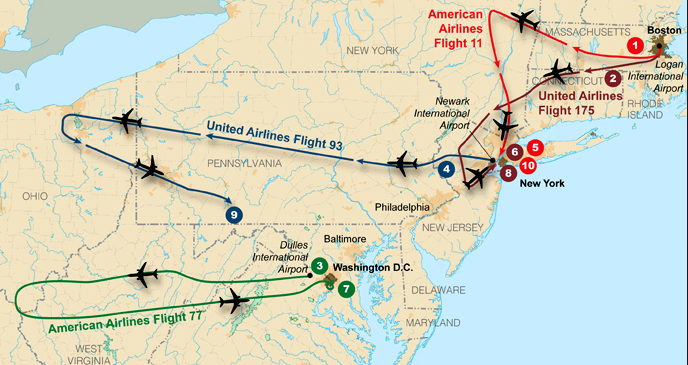 As the paths of commercial jets began to diverge from their established routes on 9/11, at what point should those charged with defending the nation have considered further debate foolhardy and taken decisive action, given the potential consequences? And when, as atmospheric CO2 concentrations have diverged radically from established patterns and headed with tremendous speed into territory humanity has never before witnessed, do we see danger not in group-think but in a lack of group action? Diversity of opinion is an admirable goal. We should be on guard against conformist thinking. But what Will and George are offering, in the guise of intellectual rigor, is an easy way out, a sugar-coated way of avoiding tough issues and thorny questions of shared responsibility for collective consequence. If you weren't able to make it to the Climate March, or only got to see the portion of it you were a part of, click below for a showing and telling of the whole progression, all four hours worth, as it passed down 42nd Street. Included are its many themes, a compilation of the most memorable slogans and chants, and serendipitous visual interactions between the march banners and the commercial billboard mega-images that served as a visual frame for the marchers. Having long ago realized that human-caused destabilization of the planet was the overarching issue of our times, I was deeply moved by its spirit, its sounds, diversity, and sheer scale. On Sunday, Sept. 21, beginning at 11:30, people from all across the country will gather at Columbus Circle in New York for what's being billed as "the largest climate march in history." I've never taken part in a march, but I'll go to this one, and I encourage everyone else to head to the Dinky that morning with plenty of time to spare. Note: Below are a book and links recommended by Rear Admiral Len Hering. The brand of conservatism practiced by Republican leaders is generally thought to be hard-edged. It offers a harsh critique of government, characterizing it as indulgent, wasteful, and to be largely dismantled. The assessment of any Democratic president is unremittingly dour. A conservative is tough on crime, or at least blue collar crime, advocating severe consequences for breaking the law. Liberals by comparison are usually portrayed as softies--soft on Communism, soft on crime. Their hearts bleed, their positions shift. They are wracked by guilt, constantly coming up with new things to worry about--the plight of the poor, global warming, polar bears, spotted owls. They seem to be making excuses for people, often portraying them as victims of circumstance. That would be the stereotype. A conservative argues instead that people are wholly responsible for their fates, that success or failure is a product not of circumstance or opportunity but of character, initiative and determination. Poverty implies laziness. Drug addiction is due to a lack of will power. It's easy to think, then, that a conservative point of view places high standards and high expectations on the self. And yet the core of hard-core conservatism is in fact very soft. Behind that facade of toughness is an ideology that largely lets people off the hook. The critique of government and the Democratic Party is so fervently pursued that no room remains for self-critique, for reflection. Conservatism is hard on others, soft on self. The legacy of the George W. Bush era--the Iraq War, expanded debt, the financial meltdown--begs for reflection and reappraisal, but prompted instead an even more extreme and defiant version of conservatism to emerge. The soft core of conservatism allows the individual to take a pass on any number of issues. Climate change doesn't exist, and if it does, it's not our fault, and if it is our fault, we can't do anything about it. At every step in that logic, the individual and the nation are excused from taking action. The belief that government is destined to fail excuses a conservative from trying to make it work. Rather than taking on the tough issue of how to balance government revenue and expenses, a conservative maintains the illusion that tax cuts pay for themselves. The complex abstractions of statistics can be avoided by basing one's views on one's own limited experience. A conservative need not question beliefs, nor care about the poor, nor care about the impact of our lifestyles on future generations and the natural world that sustains us. These are some serious perks. They excuse the individual from a responsibility to study, to understand, to reflect, to reappraise, to empathize, or to consider one's impact on others. And they go a long way in explaining the popularity of conservatism in its current manifestation. They indulge and satisfy like a chocolate whose hard shell obscures a soft, seductive center.